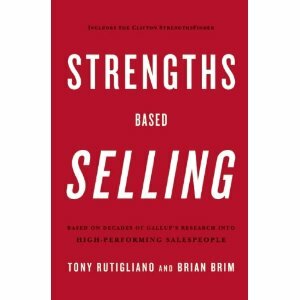 Strengths Based Selling is the latest in the strengths genre. Authored by Tony Rutigliano and Brian Brim, it is filled with Gallup's research on high-performing salespeople. Developing your strengths creatively- and managing your weaknesses (see the Appendix) -is the key to first engaging yourself and the others you serve. Engagement -and not just higher energy- is the goal, because, regardless of your work, it is central to personal well- being and higher productivity. Someone saw me toting around a copy of this book, along with Thomas Keating's Invitation to Love. Being strategic, this was normal for me. For them, these two titles didn't belong together. The authors claim that there is a contemplative approach to selling, with connections to the strengths of Ideation, Learner, Input, or Strategic. These are cerebral folks, and starting out with solutions to the "why" questions. Before convincing others, the contemplative first has to answer for themselves the question- why would anyone want this? Building advocacy is the topic taken up in Chapter 6: "You can get in the door with donuts and decorum, but you keep the door open with dialogue." p. 74. We learn to ask for others' opinions at many levels, and make sure no one feels used: "It is important to rely on more than one talent to solidify champions throughout your customer organization." p. 77. In a word, we are authentic and make it easier for people to trust us. The last chapter in the book addresses the myth of work/life balance. Yes, balance is a myth, as elusive as the migrating monarchs. Instead of balancing plates, we need to ask, what will make us feel more integrated and less fragmented? The four rules of integration: 1) There is no end date to integration 2) You cannot do it alone 3)You have to think small and 4) Integration is a choice, but it's never perfect. We could substitute many professions in place of "sales" in the following paragraph from page 146. And that would include "church" or "clergy leader." This is the challenge with a life in sales: the workday never ends. Here's the good thing: the workday never ends. People with a talent for sales often feel that their job is all-encompassing. They think about their customers while they read the paper, while they eat lunch, while they're on vacation, while they're trying to get to sleep at night. Customers, and their needs and potential, are ever present. The approach of the book is about how we can become whole people and not compartmentalize whole areas of our lives. For pastors, work/life balance is a difficult subject mainly because it is imaginary. I appreciated the honesty on this point. For those unfamiliar with their signature strengths, the back of the book provides a folder with a code inside so that you can identify your own strengths.